Master’s MP4/B-5 Food Grinder can process food waste for small foodservice operations. The MP4/B-5 is easy to install, operate and maintain. An ideal pretreatment of waste prior to composting. How Does the Food Grinder Work? Waste enters the disposer via the feed bowl where it mixes with water and is processed into a slurry comprised of approximately 95% liquid and 5% solids. The slurry is transported through up to 8′ of pipe to the attached MP4 Hydra-Extractor. The Hydra-Extractor removes most of the free water. It is equipped with a filtering screen with smaller screen holes than competitive pulpers resulting in better capture and cleaner residual gray water. Once the water is extracted, the semi-dry pulp is discharged into a container for disposal. The extracted water is diverted to the sanitary drain or, in some applications, can be pumped to a trough nozzle where grey water can be used. Reduces waste volume by 8 to 1 (87.5%). Processes up to 400 pounds of food waste per hour. Ideal for small foodservice operations. 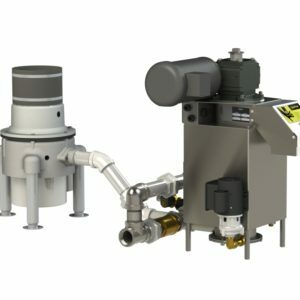 Designed to be installed with a disposer or fitted to an existing disposer.